Aveyron is the largest department in the Midi-Pyrenees. It has around 270,000 inhabitants today, while evidence of human civilisation has been found here dating back thousands of years. The Celtic Rutheni tribe has been given the credit for constructing the large, megalithic monuments found scattered around the area. Like much of the Massif Central in which it is located, it has spectacular landscapes. The many rivers and deep gorges make it a paradise for canoeing. Aveyron's most famous export is Roquefort cheese, which is produced with the large sheep population that grazes in the south. Rodez, the departmental capital, is an attractive city in a pleasant natural environment. It was founded on top of a hill overlooking the Aveyron River. It has a population of just under 24,000 inhabitants. At the highest point there is a charming Notre Dame cathedral built, curiously, in a Gothic style. The building is somewhat overshadowed, however, by its flamboyant neighbour. The 16th century bell-tower is 288ft high with a statue of the Virgin Mary perched at the top. Rodez is ideally situated to provide a base for those exploring the surrounding Aveyron countryside. If you follow the river along you'll come across the medieval town of Belcastel. There is so much preserved architecture in this town that you'd think you were on a film set. Its most proud possessions are the 15th Century Chateaux and the medieval bridge. Further along, you will discover Villefranche de Rouergue, a town that has never lost its bustling, market atmosphere. The old houses demonstrate the early affluence the town achieved, mainly through the production of wool and the extraction of silver from the local mines. In front of the central square is another Notre Dame cathedral. Inside you can admire the impressive choir stalls that the sculpture Andre Sulpice spent 15 years of his life working on. After this the river enters a dark forest. If you manage to navigate your way through it, you can get to Najac and its impressive castle. Najac is a beautiful bastide village set on the spine of a hill. (It was built on top of a volcano, but you'll have nothing to fear, as it's grown too old for any more eruptions.) Najac dates from the 13th century and is only twenty minutes by road from Villefranche, both of which lie along the Aveyron River. The town of Millau, pronounced "mee-yoh", has a population of 22,300 and is situated alongside the river Tarn in the southeast. It is situated, in fact, on the very border of the department and has long been plagued by an identity problem. The town's culture is much closer tied to Languedoc than the Midi-Pyrenees. It is a great town for anyone with a love of outdoor pursuits. Hang gliding in particular has really taken off in recent years with the town being a focal point for enthusiasts. The Parc Naturel Regional des Grands Causes can be accessed from the town. The park is home to a harsh environment of limestone plateaus, which is ideal for the formation of deep and mysterious caves. Experienced cavers are on hand to give you a tour of this underground network. Above ground, mountain bikers and walkers will find an equally challenging environment for them to explore. Depending on where you want to get to in Aveyron, you can fly to Rodez within Aveyron itself, Montpellier in neighbouring Hérault, or Toulouse in Haute-Garonne. Toulouse has the most flights, currently (April 2013) including easyJet and British Airways services. There is a train service from Toulouse to Najac and Villefranche which takes approximately 45 minutes, or indeed to Rodez. If you'd like to travel all the way by land then it is recommended to use the fast and comfortable TGV train service which will take you to Toulouse. You can then continue to Aveyron by rail. Property prices have been going up for the whole region in recent years. A large factor in this is the rise in budget airlines targeting the area making it more accessible. 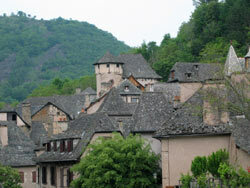 Aveyron is now very popular with foreign buyers. Do you know Aveyron better than we do? Do you have photos of Aveyron? 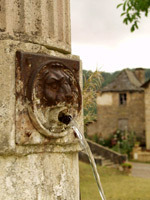 Aveyron is in the north-east of the Midi-Pyrenees.